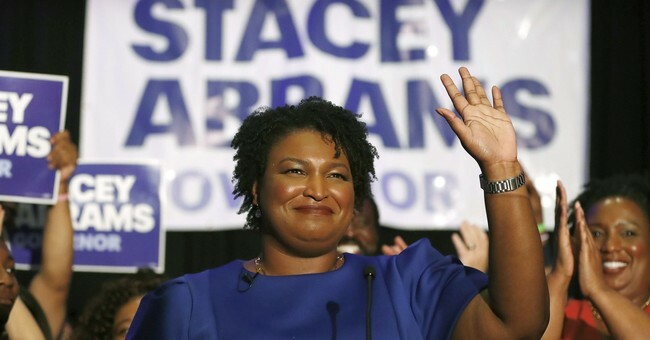 Democrat Stacey Abrams is running for governor in Georgia and like many on the left side of the political aisle, she's hoping for a "blue wave" in November. But over the weekend video surfaced of Abrams speaking to supporters about who exactly makes up the blue wave voting block. "The blue wave is African-American. It’s white, it’s Latino, it’s Asian Pacific Islander. It is disabled. It is differently abled. It is LGBTQ. It is law enforcement. It is veterans. It is made up of those who are told they are not worthy of being here, those who are documented and undocumented,” she said. Georgia Secretary of State Brian Kemp, who is running against Abrams, responded to the remarks Monday morning on Fox and Friends and pointed out her implication illegal aliens should be voting for Democrats is against the law. Kemp is leading Abrams by just two points, according to the RealClearPolitics average. Early voting in the Peach State starts today and both candidates are making their final pushes just three weeks out from Election Day. Voter registration was extended due to Hurricane Michael. Today is the first day of In-Person Early Vote, and Georgians across the state are already lining up to cast their vote! Snap a selfie with your sticker and #PostThePeach! I applaud @GovernorDeal 's decision to extend the voter reg deadline in Clay, Grady, Randolph, & Turner Counties. We have been working together to assess the potential impact of this devastating storm...we decided that an extension...was the most appropriate course of action.